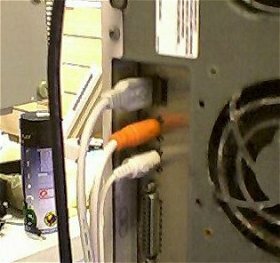 That 1982 tape is really turning from bad to worse and it is actually that constant viewing of it that prevented molds from growing on the tapes. Converting it to VCD will be a good idea and it can last longer. 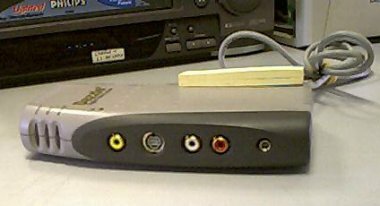 There are a few VCD conversion kit available that can do just that, converting from a source to VCDs or even DVD. See end of article for some product. 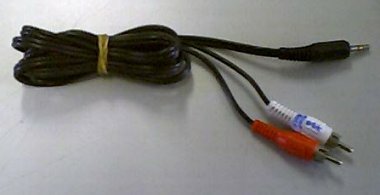 My package is old so I am not really sure what types of cables the package originally came with but these cables can be bought from places like Courts or Harvey Norman cheaply. 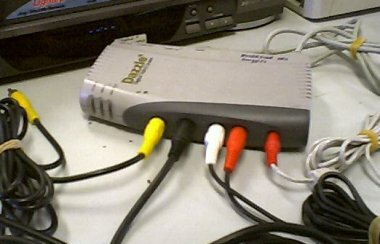 You will need a PC with at least 1 USB port and a CDRW drive, a VCR if you are going to transfer a VHS tape into VCD, respective camcorder if you are converting 8mm or miniDV tapes into VCDs. Setting up is easy but with all that cables, it’s easy to get tangling yourself together! 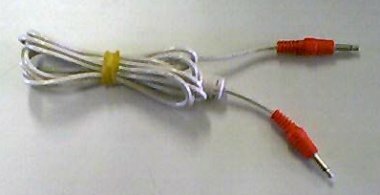 I just do the setup and left it with all the cables attached and tie them all up to make them look neat. 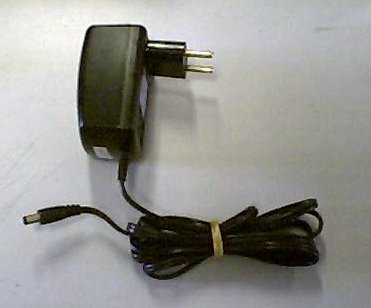 The DVC also comes with a quick setup guide which is really useful in getting up and running quickly. 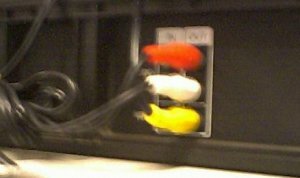 Don’t worry about connecting wrongly as most are color coded (now wouldn’t we have to thank the inventors of these cables!) and should fit into it’s respective slots easily without much effort. 2. 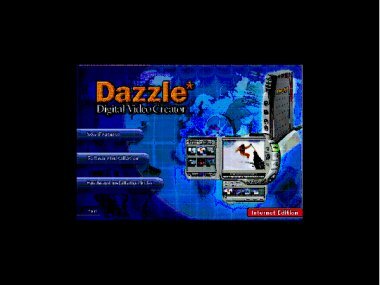 The Dazzle has 2 sides to it, one is for Input where all connection to this side are input or source of videos that are to be converted. 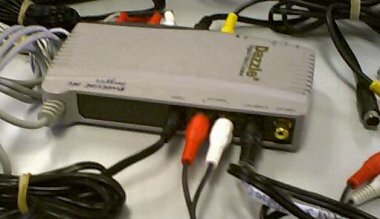 The other side is Output where every connection out of the Dazzle is for viewing, conversion can be done while watching the video on a TV. 3. We’ll start with connecting all the “INs“. 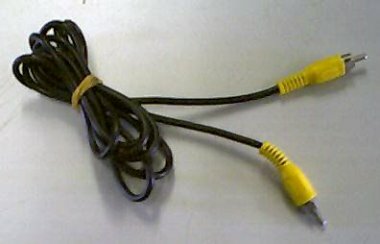 Composite Video Cable. 8. 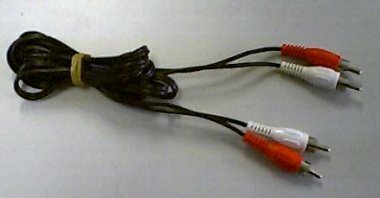 S-Video out, RCA/Mini cable out and lastly, plug in the power source to the Dazzle. Now plug the Dazzle into the PC’s USB port and Turn on the PC. 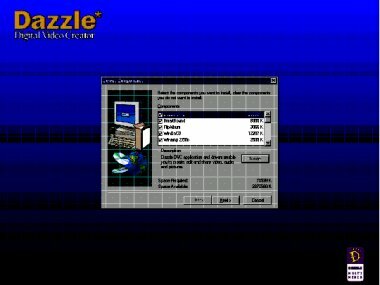 Now the Dazzle is detected by Windows, insert the CD Rom driver that came with Snazzi. Click on Next>. After some reading and copying of files, it is done! Click Finish. 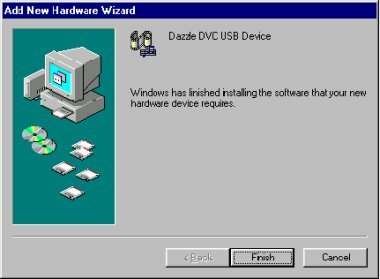 Now we will setup the Dazzle. 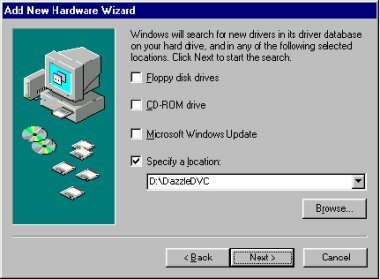 Eject the CDROM and re-insert it, the following program will run. 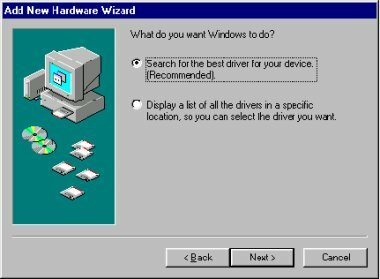 Click on “Software Installation”. 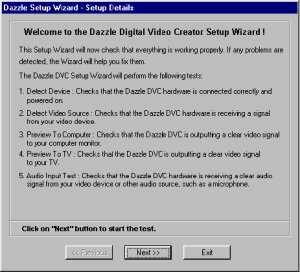 Select all the software or the software you need, But the Dazzle DVC is needed, others are optional. 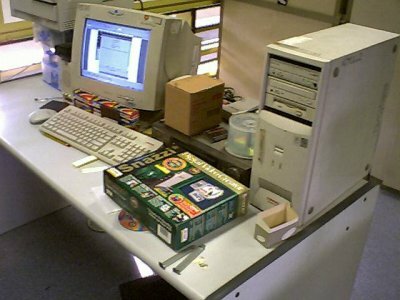 When it is done, it will run all other software that you have slected in the first step. When all is done, the setup program will exit by itself, it may take some time. 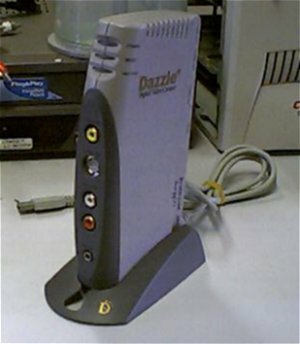 Now to setup the DVC program. 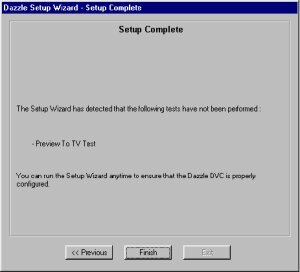 Click Next >> when you see the above, now, Dazzle Setup Wizard will attempt to detect the video source input. Just leave it running. Source detected! Although the above screenshot just shows a black screen, there was actually playback when the screenshot is taken. Anyway, click Yes to “Do you see the preview” when your video source is detected. 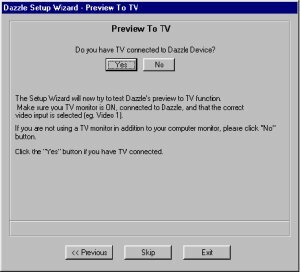 It now ask if you have a TV connected to the Dazz;e’s out. In my case, there isn’t. So I just click on No. 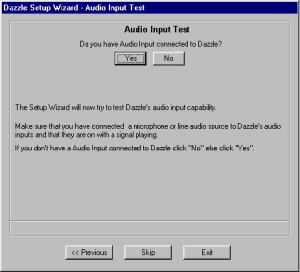 And next it ask if there is Audio connected to Dazzle, yes I have and it’s connected to the Mic port of the sound card in the PC. SO I click on Yes and then on Mic. 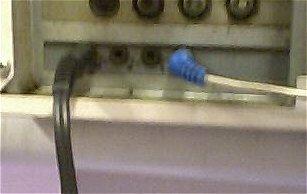 There you can see the above screenshot, the RCA/Mini cable is connected to the Mic port of the sound card in the PC. And it’s all done! Simple wasn’t it?! Now, let’s get on with business! 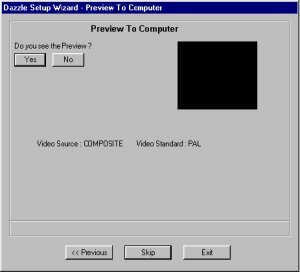 We’ll convert a VHS tape to VCD. 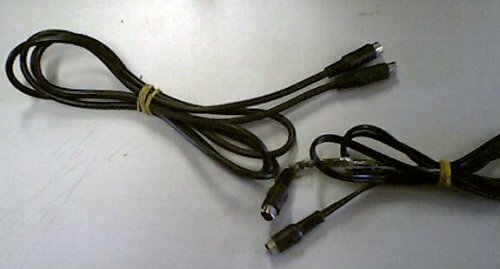 You will first of all connect the cable into the VCR’s OUT and the other end of the cable is going into the Dazzle’s IN. Remember, don’t get this wrong or it won’t work. And again, there is actually a lady doing gymnastics in the above screenshot when it was taken but taking screenshot of moving video seems to just leave it black. No I am not kidding or cheating! 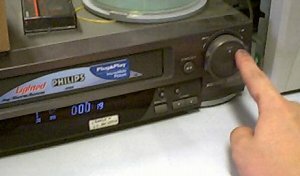 Setting the time to record is important and you need to understand what CD-R you will be burning to later. 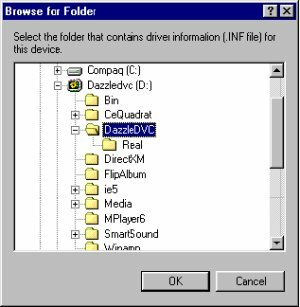 If you’re using a 650mb CD-R like I am, you need to set time of recording to 74 mins or less, if you record using Dazzle over that time limit, later you will have to split that file in order to burn it as a VCD as your CD-R can only hold 74mins, anything longer will not fit into it. 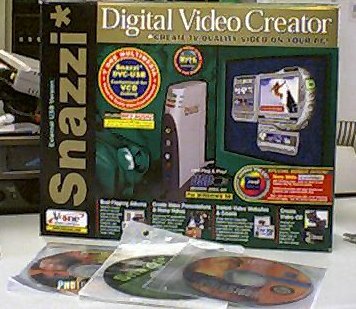 On the other hand, a 700mb CD-R can hold 80 mins of video. I am playing safe and is setting it to 70mins instead, that’s already 1 hour and 10 mins of video on 1 CD. Now you understand why movies VCD you buy from shops comes in 2CDs instead of just 1…because they cannot fit onto just one! 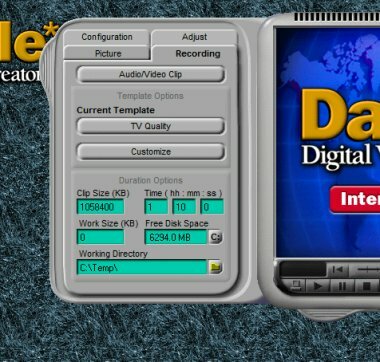 Unlike a DVD, where 2 whole hours (or more) of video entertainment can fit into just one disc, but that’s another story/ article…Now, let’s change the settings to our predefined timing. Click on the little Tab sticking out of the Main Windows and the following screen will be pulled out, click on the tab Recording. Here, set it to (in my case as I only have 650mb CD-Rs) 1 hour 10 mins and 0 secs. I have also set a path to store my recorded video and that’s in C:\Temp. The rest are left as the default but of course you are welcome to modify it to your likings, just remember a rule of thumb, the better a video quality is, the bigger the file size is going to be thus Good Quality = Big File Size. So getting or having a big hard disk drive is a must in video editing/ recording/ converting.